English has been recognised as the global language of business, according to this article from the Harvard Business Review: Global businesses speak English with virtually all the large international companies requiring a majority of their employees to speak English. This means that being fluent in English is a real advantage for many children when it comes to moving into the world of work. There are, of course, many ways for children to learn English, including being taught at school, but one of the most successful ways of teaching English in France, for example, is for a child (perhaps two friends or siblings) to stay with one of the many English families now living in France. When we think about it, our native language is absorbed in our very early years, by hearing conversations all around us, having specific words or expressions repeated frequently, together with the facial expressions and non-verbal cues that go with the words. One would not warn a baby that a fire was hot, for instance, with an encouraging smile and a jokey tone of voice. 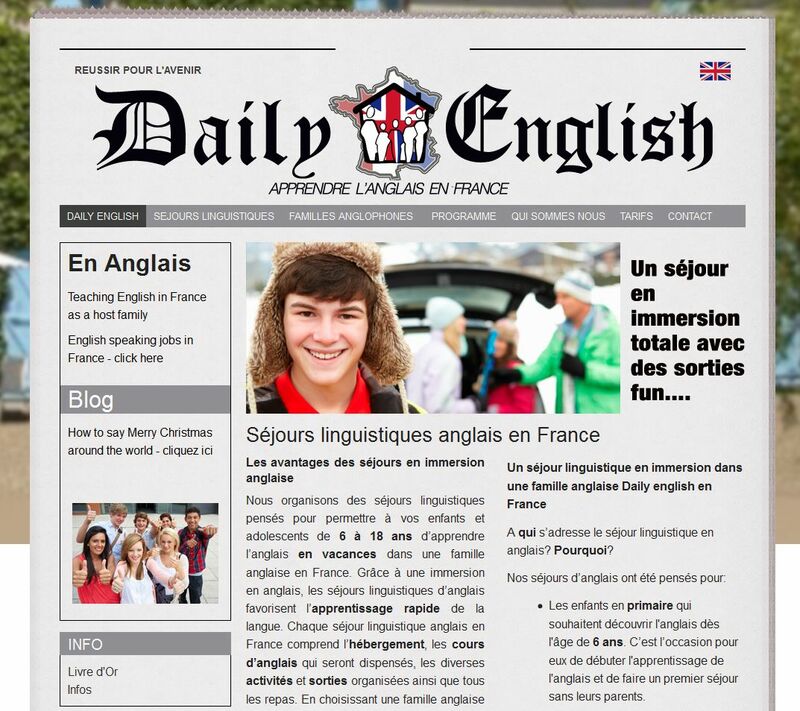 One recommended method of replicating this kind of holistic approach to teaching English in France is through a company called Daily English, who arrange for French children to stay with English host families, for periods of either six or thirteen days (Sunday to Saturday) during the school holidays. With around a quarter of a million English people now living in France, Daily English offers both the English family an opportunity to earn some income and the French children the opportunity to live with an English family which has children of a similar age, for short periods. The Daily English website has more information, but some of the key advantages and features are listed below. There is considerable flexibility in the amount of time you work, from one or two weeks up to around twenty plus weeks per year. This is paid employment where you can work from home and continue to care for your own children. There is support from Daily English in the form of lesson plans, suggested projects and 24 hour availability whilst you are acting as a host family. Opportunities exist to teach English in many parts of France, including Paris and all the major cities. They have the security of a family environment. Their learning of English is not restricted to formal lessons, but includes the normal family interaction of meal times, outings, and peer conversations, so that the language is absorbed in a more natural way. It is possible for up to four children (a minimum of two), whether friends or siblings, to stay with the same host family, thus reducing the possibility of homesickness. There are a number of fun, joint projects suggested by Daily English, so that the range of language spoken is quite broad. Obviously, this type of English speaking job in France is not for everyone and there is a requirement for one of the parents to have a teaching qualification, any degree from an English university, or to have had experience of teaching English in France. That said, it can be very rewarding and friendships can be built up which can last for many years.